Montblanc has launched Legend Pour Femme, the feminine counterpart to last year's Montblanc Legend. The new fragrance is a tribute to elegance and the style icons (Greta Garbo, Grace Kelly, Ingrid Bergman) who have inspired the luxury brand. Legend Pour Femme was developed by perfumers Bernard Ellena and Nathalie Feisthauer. The notes include neroli, pear, bitter orange, orange blossom, lily of the valley, jasmine, musk, vanilla and blonde woods. 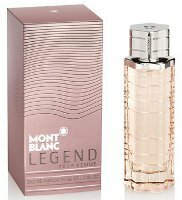 Montblanc Legend Pour Femme is available in 30, 50 and 75 ml Eau de Parfum. Bottle… DIVINE…. Notes…. SUBLIME…. Sounds Fantabulous! It is a nice looking bottle…I like it better than the men’s Legend. Have to agree w/ that! Why was it left to Byredo to come up with an inky perfume? I guess inky is too niche?